Recently, while making bread pudding, I found myself in posession of a unique problem: too many cubes of bread. The recipe I was using required about 5 cups of cubed day-old bread, and I had about 7 cups. It was a good bread, too: a loaf of Rubicon Bakery's cinnamon bread (something they make exclusively for Whole Foods, I just learned while looking at their website). It's a very nice loaf of bread, so I didn't want to waste the cubes by throwing them out. But then again, it was too many cubes to use in the recipe...so what to do? That's when it hit me. 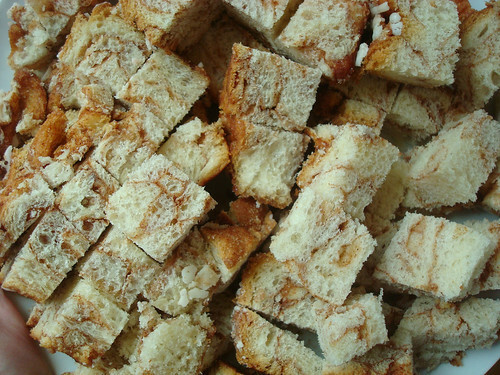 I would exactly what I would if it were a non-sweet bread: I'd make croutons. Only since this bread was already sweet, I wouldn't try to make them savory croutons for salads--I'd make them sweet croutons, for dessert toppings. 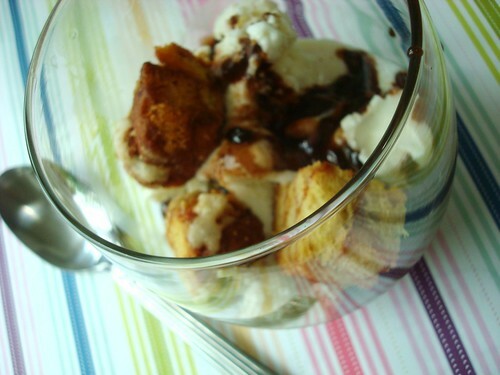 Dessert Croutons! Are you not shivering with sweet anticipation right now? 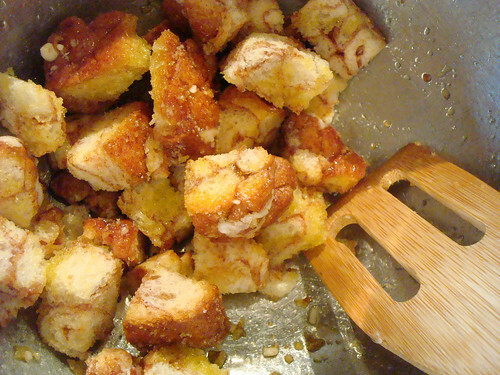 I looked at a homemade crouton recipe as a reference, and then set to tailoring the recipe to work as a sweet dish. I was going to cover them with butter, but then I realized I had no butter. But I did have olive oil. I remember hearing a radio interview in which Alice Medrich gushes about the utter loveliness of olive oil on ice cream, so I thought...why not give this a try? 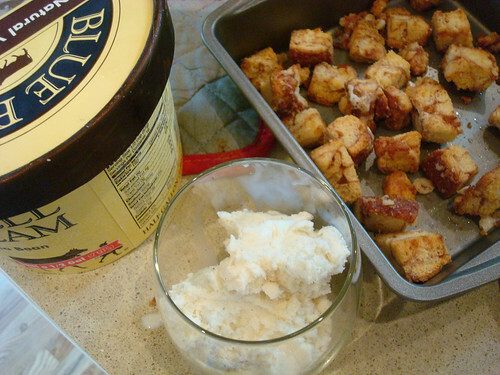 If the dessert croutons are made with olive oil, maybe they'll work really nicely with ice cream. So, I preheated the oven then coated the cubes with some olive oil and gave them a gentle but thorough stir. Then, I dusted them with a little cinnamon sugar (why not?). Then, I put them in a pan. Then, I baked 'em up, pausing to flip them over after about 8 minutes. At about 16 minutes, I took them out. I let them cool for a while, then broke out the ice cream. Wait...I think I'll add some chocolate sauce, too. That never hurts anything. 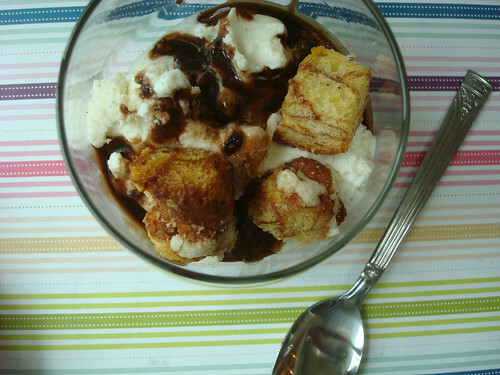 Plus, I reasoned, it would add a color contrast and help the croutons stick for a nice photo. I am, after all, a food blogger. YES! 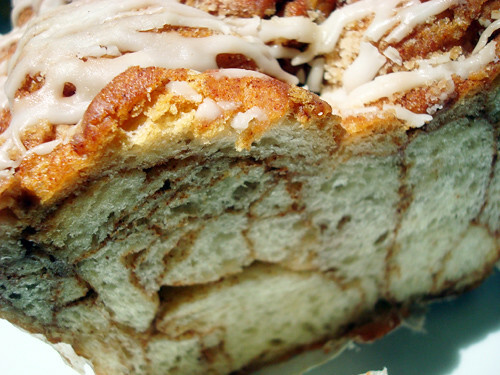 Just look at how the cinnamon swirl adds a pretty echoing color to the chocolate sauce. Look at how wonderfully golden and toasty they look. Upon tasing them, these croutons were proclaimed a rousing success. They're not as sweet as crumbled cookies or cake, but they act in the same manner as an ice cream topping: adding a little extra flavor and texture. 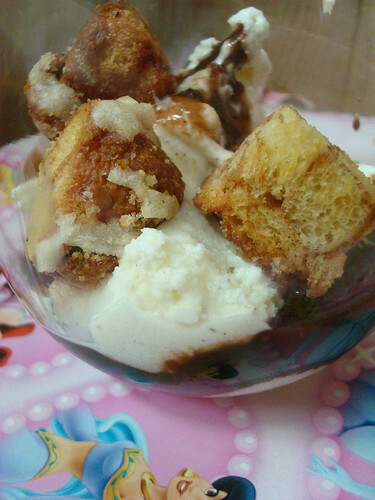 The crunchiness was also more intense than that of a cookie or cake crumb, so it added a really nice contrast to the soft ice cream and chocolate sauce. 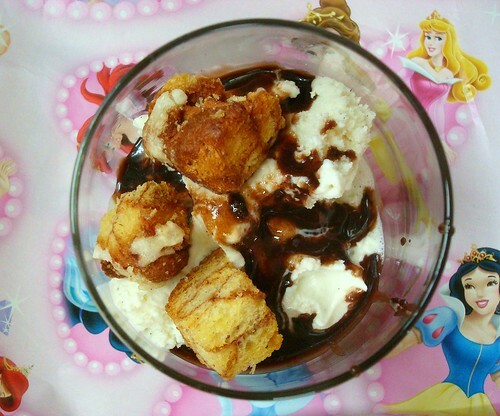 The ideal moment was about 1/4 to 1/2 of the way in, when the croutons just started to become soft as they absorbed the ice cream and chocolate. Perfect. The olive oil actually worked out excellently. 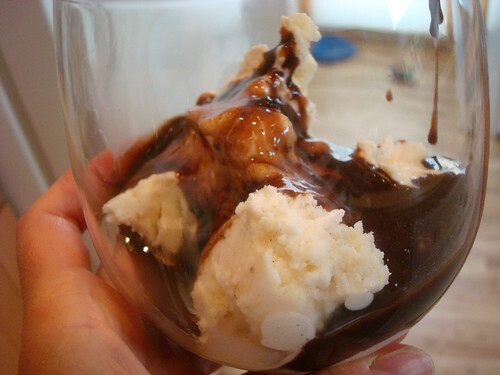 It acted as a nice counterpart to the sweetness of the other toppings, and added a complexity to the other flavors--especially the chocolate. The glaze on the bread, too, contributed to the deliciousness: in the oven, it appeared to have melted into the bread, but upon crunching into one of the croutons, I learned that it actually formed a sort of sweet shellac all over them. It also made for a fascinating flavor combination with the olive oil. While I am eager to try this again with butter, I have to say, I was really rewarded by the olive oil version. Here's the recipe so you can try it out at home! Keep in mind since you're probably using this recipe with leftover bread, I am going to make it open ended for you. While the oven preheats, put the cubed bread in a large bowl. Drizzle evenly with the olive oil or butter, stirring so that everything gets coated. You can add more if you feel that they're too dry. Add cinnamon and sugar, if desired, and stir to coat. Transfer the cubes to a baking pan where they can lie in a single, flat layer. Place in the preheated oven, and bake for anywhere between 15 and 25 minutes (it will vary depending on the bread you use). 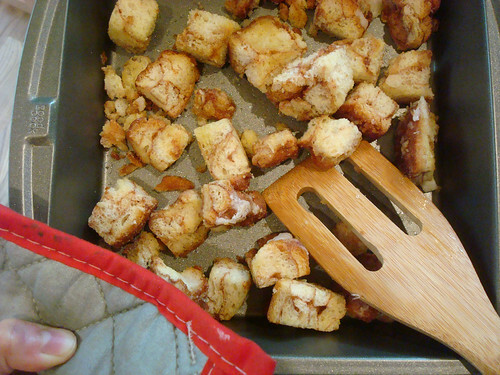 Turn the croutons about 8-10 minutes in, so that they will be browned evenly. You'll know they're done when they're golden and toasty. Remove from the oven and let cool before using. Store leftovers in an airtight container. They'll keep very well for a few weeks.